We built a Playhouse Coop, and pretty much stuck to the plans. The roof is corrugated plastic called Tuftex; you can get it a Lowes. We live in an urban area and could not find metal seam roofing for a reasonable price, so we had to substitute materials The ridge is just aluminum flashing. The stones around the bottom are there to create an additional critter barrier. My husband has intermediate construction skills, and it went pretty well. Each panel is built flat and the prices are screwed together on site. He does not have a table saw and managed with some ingeunuity to use just his circular saw. Here he is assembling the panels, and below is the shell minus the roof. Painting was my job. For the most part the plans were easy to follow, although there is a certain sparseness on how to do some of the finish details. 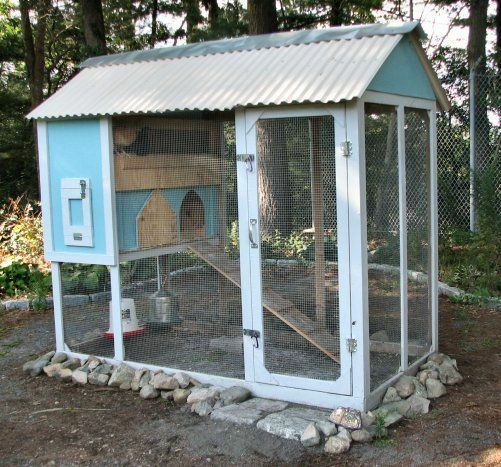 For example, the front panel is removeable so the coop and be cleaned, and the plans specify carriage bolts as a fastener. Another suggested method is to make the front a swinging door (this is what we did) but the plans don't actually tell you how to do this, and there is no materials list for this alternate method. In the end my hsuband used two hinges on the left side and three sliding bolts to secure the front; one is at the bottom of the right side, and two are at the top, left and right, to secure the flip down opening you see above. This fall I added weatherstirping around the hen door, the egg door and on the flip down opening. And finally some views of the inside and the front. The plan calls for a sliding door, but we don't have a router, so my husband built a swing door. Overall we're pretty happy with it, and it looks nice in our yard. The photos on this page were taken before I finished painting. Cute. seems a bit small, but easy to put together. THATS A VERY CUTE COOP INDEED! Hi I'm so sorry I didn't see all of your commets till today! These plans are the Playhouse Coop by Dennis Noonan. He sells them through http://mypetchicken.com ($35) and he also has a blog: http://playhousecoop.blogspot.com/. Our coop is about 4 years old now and it has worked out just great. The only thing I'd change would be to move the door to the short side so I don't get wet when it rains. I also think the run size is a tad small even for 3-4 chickens. I recommend making the total length 12 feet instead of 8 feet. 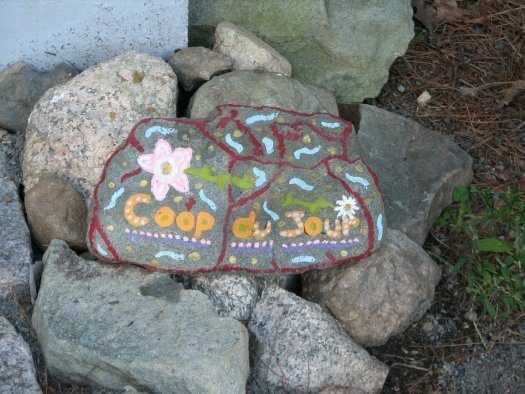 I have to say though that even Williams-Sonoma sells coops now; this cost us about $500 to build (we're near Boston) and these days a ready-madecoop can be bought on-line for the same amount of money. same I want to build it soo bad! I was wondering the same thing! I really like your coop and if you stilll have the plan i would lik to know where you got it. Hi! I love this coop! 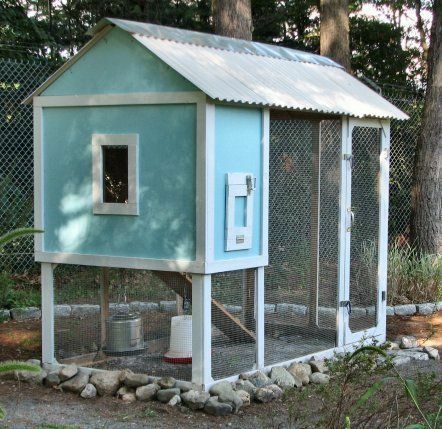 I am wanting to get a few chickens just for the eggs, and this coop is perfect. May I ask where you got the plans?